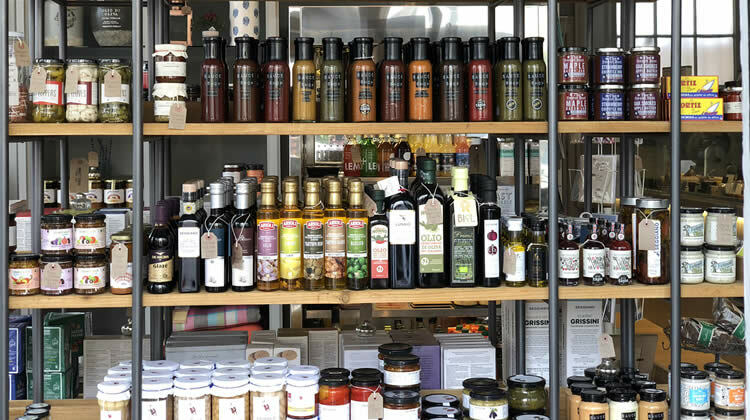 Our artisan delicatessen in Eastbourne also offers a fantastic selection of accompaniments to the cheeses and charcuterie we sell, as well as a selection of everyday kitchen and larder essentials, all of which have been sourced from the finest suppliers and local producers. We try wherever possible to stock organic or fair trade products, as we do genuinely have a concern over how most mass produced products are made. Cheese biscuits and crackers, chutneys, fruit purees, olive oils, vinegars, jams, pasta, pasta sauces, risotto rice, wild rice, red rice, teas, fair trade coffee, beans and pulses, honey, spices, herbs, salad dressings, biscuits, cakes, crisps, farm pressed fruit juices, artisan chocolate......the list goes on and on!! Carved Angel, Seggiano, Chegworth Valley, Prince and Son Teas, Brindisa, Stach Chocolate, The Fine Cheese Company, Fairfields Crisps, Steenbergs, Island Bakery, Climpson & Son Coffee, Sauce Shop, Single Variety, La Mortuacienne ........this list goes on and on too!! The best way to see our entire range is to come over to the deli and visit us in person. Then you can browse through everything we have to offer and hopefully find something new and exciting to take home.